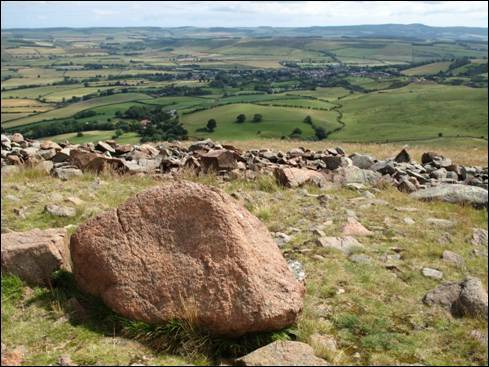 The market town of Wooler is the perfect starting point for a walk along the northern edge of the Cheviot Hills. With an assortment of small rounded tops to explore, the route possibilities for walkers of all abilities are immense. Throw in the incentive of a cappuccino and a jam filled muffin at the end of the day and how could anybody resist? It was early June and, with the weather forecasters promising sunny intervals, I was expecting a very pleasant day out. I had a slightly undulating 9½ mile circular walk in mind as I headed out of the town past the 1856-built St. Ninian`s Church. The heavy-eyed campers at Highburn House Caravan Park were just beginning to emerge from their flimsy shelters as I made my way towards the tiny hamlet of Humbleton. The well-walked path across the lower slopes of Humbleton and Harehope Hills was a doddle and I was soon descending towards the Akeld Burn and the picturesque buildings of Gleadscleugh. Ignoring the map-marked public footpath, I followed a faint hill-climbing quad track to the cairn-capped subsidiary top of Akeld Hill. I lingered for a moment and enjoyed the fine views across the farmland-rich Milfield Plain. The actual summit, a mere 16 metres higher and boasting a small cairn and the remains of a large post-medieval sheep fold, lay within shouting distance and offered an excellent panorama of the distinctively-shaped, hillfort-crowned Yeavering Bell. I then picked my way carefully across a tangle of knee-high heather to the unmarked summit of White Law and a near-vertical ladder stile. Once on the other side of this wooden staircase, a handy dry stone wall guided me over rollercoaster grasslands, still wet with dew, to the rocky promontory of Tom Tallon`s Crag, just over a mile away. Whilst small in scale this is a superb place to view the high hills of the Cheviot heartland as well as being the ideal spot to take a well-earned break. I was now at the farthest point of my walk and my stomach was beginning to grumble. It was time for lunch. The way back to Wooler lay across a large expanse of heather moor and followed, for the most part, the 62½ mile St. Cuthbert`s Way a waymarked route which links together the religious sites of Melrose Abbey and Lindisfarne. Along the way, I made a short detour to visit the pancake-flat summit of Gains Law and the hillfort-capped Humbleton Hill. Built in about 300 BC, the hillfort, with its pink stone ramparts, was one of the most strongly defended settlements in the area. As I looked down towards the nearby blood-soaked site of the 1402 Battle of Homildon Hill I felt the tingle of history run up and down my spine. The sun crept out from behind a tattered curtain of cloud as I jogged down the steep grass-carpeted slopes of Humbleton Hill towards the stone track which would lead me back to Wooler. As I retraced my outward route past the caravan park on the edge of town a mother duck and her brood of adorable ducklings waddled towards a family of campers and their mouth-watering picnic lunch. It had been that kind of day.